It's going to be a big weekend for Malayalam cinema as two high profile films hit the screens. V K Prakash's Trivandrum Lodge brings back the trio of VKP, actor Jayasurya, and scenarist and actor Anoop Menon, who made the hit film Beautiful last year. The other major release is Husbands in Goa, produced by UTV Motion Pictures and directed by Saji Surendran. It's also a crucial day for actor Jayasurya, who is going through a rather tough patch in his career. He plays important roles in both the multi-starrers. Here is a closer look at the films. Trivandrum Lodge connects the lives of some of the characters. "Why this lodge, which is situated at Mattanchery, has been called so is part of the film's suspense. It is also a metaphor to describe life, or let's say, the human mind where various emotions are being played out," says Anoop Menon. Honey Rose, who was originally launched by Vinayan in his Boy Friend, plays the female lead with a new name, Dhwani. Bhavana plays the other female lead. Trivandrum Lodge has a huge star cast as well as singer P Jayachandran, Saiju Kurup, Arun and P Balachandran. "I am playing a character named Abdu, who is a sexually frustrated recluse. 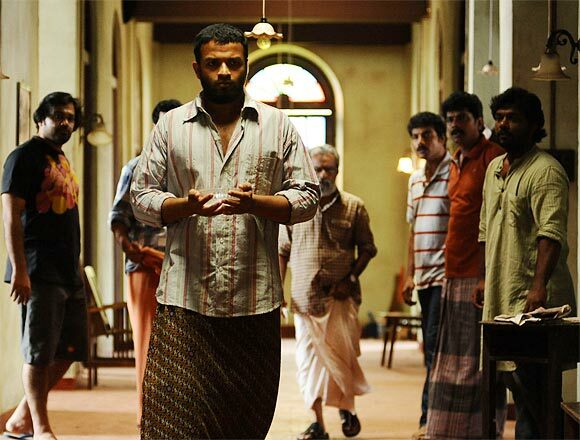 He is not very educated and rarely shows his emotions," says Jayasurya. Trivandrum Lodge is produced by Time Ads. The cinematographer is Pradeep Nair and the music director is M Jayachandran. "It's a laugh riot about the travails of three long-suffering husbands, but not a sequel to Happy Husbands," says director Saji Surendran about Husbands in Goa. Govind (Jayasurya), a chartered accountant, is married to Abhirami (Bhama), who is very religious. Jerry Thomas (Indrajith), is a busy lawyer married to a lazy girl named Teena (Rima Kallingal). Arjun (Asif Ali), an interior designer is fed up with his wife Veena (Remya Nambeesan), who insists he tries for the civil services exam. Tired of their wives' dominating ways, the three husbands decide to have some fun in Goa. During the journey, they meet a cinematographer named Sunny Abraham and certain unprecedented events happen from then on. Husbands in Goa is UTV Motion Pictures' second production in Malayalam after Grandmaster. Anil Nair is the cinematographer and Krishna Poojappura is the scenarist. The music director is M G Sreekumar.